If you’re like most business owners and marketers you’ve been beaten down and submitted to the fact that you need to produce content, lots of it, in order to compete, educate, be found and convert sales. The fact that content has become such an important element has also made it one of the most frustrating, time consuming and confusing for the typical small business. Some of my most popular blog posts over the last few years have been ones where I dive into practical ways to make content creation and implementation in the form of blogging, eBook creation, article writing, workshops and strategic partnering more attainable. That’s why I created a new eBook appropriately titled – The Crazy Busy Marketer’s Guide to Content Creation in the Real World. In this 34 page work I cover how to find content, the types of content every business needs, how to use content in every phase of the customer cycle, how to use content for referrals, and how to amplify the content you produce to get the greatest exposure. The eBook is my gift to you my readers. 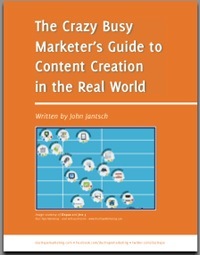 Go download The Crazy Busy Marketer’s Guide to Content Creation in the Real World and let me know what you think.